Here are some Coton de Tulear resources to help you learn more about this wonderful dog breed. Learn about grooming, training, breed characteristics, and much more. 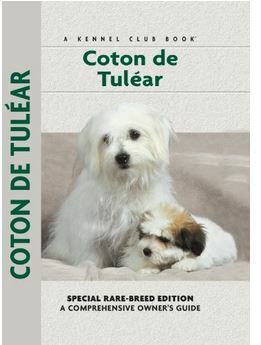 Manual de Coton de Tulear. Compilation of articles in one book written by different breeders, groomers, trainers, and vets. Great resource for all new Coton owners. The Official Coton de Tulear Book. This is my "go to" resource for Coton information. It's a CD-ROM put out by the Coton de Tulear Club of America. You'll find detailed information about health, genetics, history, grooming, behavior, food, and much more. Coton De Tulear (Kennel Club Dog Breed Series) This book is well written and one of the best Coton de Tulear resources available from booksellers. (It's more affordable if you have an e-reader). In my opinion, while it's more professionally packaged, the information isn't as in depth as the Manual de Coton de Tulelar. Dr. Pitcairn's Complete Guide to Natural Health for Dogs & Cats. This book was recommended by my homeopathic veterinarian. If you're looking for chemical-free, non-toxic, natural, safe remedies for anything from burns, insect bites, vomiting & even cancer, this is a must-have book. Small Dogs, Big Hearts: A Guide to Caring for Your Little Dog , Revised Edition You just can't treat a small dog the same way you treat a big dog, at least not physically. This is a great resource to help you have the best relationship with your furry friend. The Dog Bible: Everything Your Dog Wants You to Know Anyone who owns a dog knows that they are bound to get into some kind of trouble eventually. I don’t know how many times I had to call a vet or Poison Control over the years when the dog ate something he shouldn’t have. This is one of the best resources I’ve found to answer all kinds of pet safety questions such as what to do when your dog gets stung by a bee, which plants are dangerous, what foods can be lethal, clean products to avoid, etc. This resource can save a great deal of time and money when your dog gets “in trouble”, not to mention it can give you peace of mind and prevent panic. Check out the entire list of our favorite dog training books here. Visit our Dog Training Reviews page to learn which dog training program is best for your needs. Not all training programs are equal, so make sure to find the one that's right for you and your dog. Dogfood Advisor. Want to learn if your dog's food is healthy, nutritious, or safe? This website will provide detailed analysis of thousands of dog foods and help you make the right decision on what to feed your dog. Sign up for their free e-mail notifications when there's a dog food recall. How much do dogs sleep? Is your dog sleeping too much? Not enough? Learn what's "normal" and what you can do to enhance your dog's sleep. Join our Facebook community of Coton lovers. Another of our favorite Coton de Tulear resources - chat with other "Coton people" from all over the world. Coton FAQs. Ask a question about this rare breed or provide answer to others' questions. Visitors to this site have shared their own expertise and experience so we can all learn more about our Cotton Dogs.